After an extended break, I have decided to produce a limited number of whips to sell going forward. At this time, I am not taking custom orders, but I will be posting available whips on eBay for sale as I complete them. The whip in the photo is now listed on eBay. These whips are are neon yellow and neon orange with the reflective trace and available not only as cow whips, but as bullwhips, snakewhips, and stockwhips as well. This makes them both black light reactive and they will reflect brilliantly when light shined upon them. The result looks almost like you’ve harnessed lightning. These whips are not waxed because the wax dampens the reflective quality of the neon orange cord. This particular cow whip weighs in at just 11.4 ounces and the 16″ ash handle weights a mere 4.5 ounces, making this whip a very light weight cow whip. This prototype Lightning Whip will be auctioned on eBay later today. Be sure to like us on Facebook or Follow us on Twitter to get the link when it is posted. Applying this new reflective paracord to our line of survival bracelets gives us a new twist on a popular product. When applied to our bracelets, you have a high visibility bracelet that does everything regular paracord bracelets are made to do with the added benefit that whenever you’re in the dark and light shines upon this bracelet really shines! The color and reflective quality make these bracelets great for hunters. But also for people who jog, cycle, or walk near streets or roads, these bracelets could alert oncoming motorists to your presence and help you avoid being stuck by a motorist. Look carefully at the photos of my son above to see how well the bracelet reflects. This first safety strap will be given away in a drawing from those who joined my email newsletter. Prices start at $20.00 for the larger sized bracelet seen here. They can be ordered by contacting us by one of the options seen on the contact/order page. The name “Kelley Lightning Whips” is copyright 2012 by Rhett Kelley Whips, LLC. All Rights Reserved. Cowwhips.com has a new look, new products, and a new way to order! The first new tab you’ll notice on the navigation tab is the new online store. There you will find all of the nylon whips and other products that are available. Under the store tab you will find a FAQ page where I have attempted to post most of the common questions people ask me as well as a few hypothetical questions I think may arise from time to time. The 2nd tab is all “About,” there you will find a drop down that contains lots of information about myself and the business. The 3rd tab is the Gallery. There you can find lots if pictures of whips I’ve made. I intend to keep this updated with new pictures on a regular basis. The 4th is the Contact page. Please note the new business hours and email address. The final tab is a link back to this blog. And that’s about it for the tour. I hope it helps. Stop by and see the newly remodeled Cowwhips.com! New look, new products, and new lower prices on standard 16 plait bullwhips! I’m very happy to announce that I’m working out the details to be able to offer complete kits to go along with my whipmaking DVDs! The kits will offer my DVD students the essential tools needed for the project, but without having to shop all over the web to find them. The kits will include: a cow whip handle, sinker cord, lacing needle, hemostats, fid, woodburning tool, and 500ft of coreless nylon paracord in one color. Selling paracord is something I swore I’d never get into. However, I recently stumbled upon a deal that will allow me to offer my customers and friends coreless paracord at a good price. 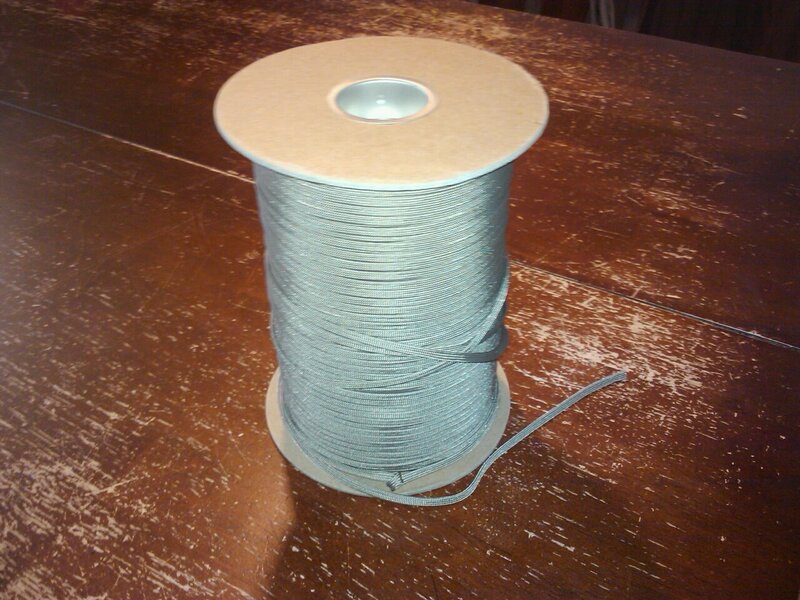 I will soon have available 500ft spools of coreless paracord in all the usual colors we whipmakers use. While the coreless cord won’t be quit as cheap as the regular cord, the time a whipmaker saves having to pull out the inner stands will make it worth the extra price. To keep things simple, I will only offer 500ft spools. I don’t have the time or manpower for getting into making custom cut orders. The spools will cost $35.00 each plus shipping. I am securing the regional flat rate shipping boxes from USPS in order to keep shipping prices as low as possible. Though I’m going to be selling coreless paracord, I will continue to recommend all my original suppliers for your regular paracord needs as they can provide it at better prices that I can right now. Until I get everything put together and added to my website, you can order cord and kits directly from me by calling or emailing me (See contact/order page). Stay tuned for more information.